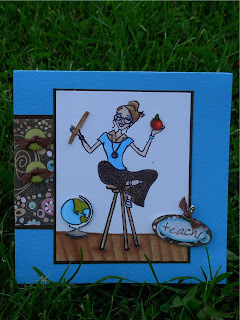 Here is a very quick sneak peek of the new Hanna Teacher set...................I just love her......................This card was created with Prism and Basic Grey Papers, Copic Markers, twill ribbon and olive buttons. The sentiment is punched with SU! Oval punches and the floor was hand drawn and shaded. Don't forget to join us for the Release Party Tomorrow night! Finally a sneak peek!!! Albeit, not the best picture I have ever taken.................whine whine sniff sniff!!!!!! I feel as if I lost my right arm without my photoshop!!!!! Isn't this the most adorable set?? I combined Teacher Hanna with the School Riley to come up with this card. 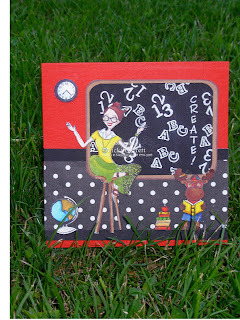 The blackboard is stamped with the numbers and letters background stamp and filled in with white gel pen. The clock and globe are stamped and coloured from the accessories set. Colouring is completed with Copic Markers and Silver Gel Pen. We are having a fabulous release party this Thursday night in the Hanna Member Forum on SplitcoaststampePublish Postrs. The party starts at 9 p.m. EST. Come on over. We have great challenges, Mystery Prizes and always a hoot. Hope to see you there!!! Don't forget to check the sneak peeks of my wonderful Design Team mates!!!!!!! See you tomorrow with another Sneak Peek!!!!!!! Well, as you can see, I arrived home safely from my Trip to CHA Chicago, followed by a leisurely week at the cottage, where I was able to create some adorable cards. Quite a few of the cards I made were sneak peeks for the new Hanna Release, which will happen this Thursday evening at Midnight. I have SO much to tell, but in a nutshell as much as I have had a wonderful two weeks, I have had some big glitches. Firstly I broke the lens for my Camera when I got stranded in Washington D.C. on my way home from Chicago. Oh yes, I have a small point and shoot camera for back up, but it appears to have gone missing in action. Oh and did I mention that I wiped my entire computer out this weekend. Not such a bad thing on one hand as when I installed all the applications again, I was able to retrieve the information. Not so good on the other hand because my Photoshop Program appears to have gone on vacation. Anyway, I hope to get it all sorted out in a day or two!. I have some amazing pictures to show from CHA as well and some sweet tales to tell. You needn't miss out on the amazing sneak peek that the talented Hanna Team has for you. Follow the link on my Sidebar to see their wonderful creations every day this week!!!!! The party starts Thursday evening at 9 p.m. EST in the Hanna Member Forum. Oh my Gosh!!! There doesn't seem to be enough hours in a day at the best of times, but this week I could have used an additional 8 or 10 per day. the positive thing about the week was that I was blessed to be afforded the opportunity to train other Program Facilitators in a new Violence Prevention Program. I was also co facilitating with Diane, who has been a mentor and a positive role model since the time I was a nervous newbie, sitting in her classroom learning to teach Cognitive skills. So ultimately, the pressure was on!!!!! First of all, it is very different to deliver a Program to your client group, then to teach others to facilitate the Program. Secondly, I was a little nervous, being my first time and all and most of all, I needed to ensure to the best of my ability that I put in the utmost effort to ensure that I created lesson plans that reflected a good understanding of the information and skills that I was teaching. Needless to say, much time of my time in the last few weeks was put into meeting this objective. I was well prepared for the lessons, but I wasn't prepared for the exhaustion!! I am a night owl and rarely go to bed before 1 a.m. but this week I was an 11 O'clock girl. By the time I got home each night and finished my "homework", I thought I would die!!! Anyway, hoping to get caught up on a few things this weekend and paying a little more attention to getting some posts on for you! This was a neat little project that I came up with for the Hanna July Release. 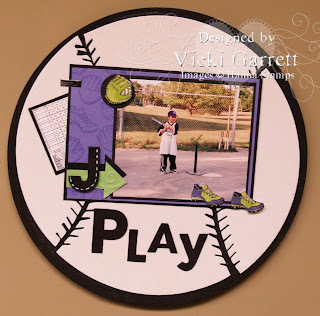 Using the accessories from the Hanna Baseball set and a Dollar Store Mouse Pad/Bulletin Board, I created this little altered Scrapbook item. This is my wee Jonathon, when he was but a little tyke!!! 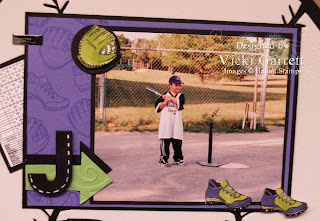 I used the shoes, ball and glove from the stamp set to create a background on the mat, as well as colouring and cutting out the shoes and clove. I shrunk a Baseball Score Card down and used the arrow punches from SU as an accent. The Title Letters are die Cuts from a Cuttlebug Alphabet. I used Green Galore and Lovely Lilac as my main colours, with black accents. This was definitely a fun project to do. I put a magnet on the back and it presently makes a nice accent for my refrigerator. Hanna has some cool new releases for you today. Wouldn't you love to be relaxing on that hammock right now!!!!!! 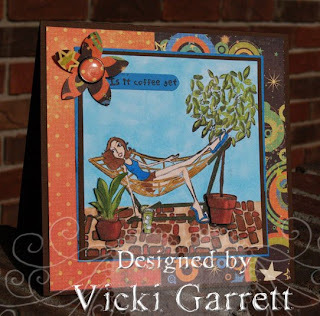 This sweet card was made with the Lazy Days image as well as the Hanna Patio Sets. All sorts of sweet stamps to create lazy Summer Scenes. Even the cool cobblestone is a stamp!!!! In addition, a Beautiful Wedding Set and Baseball Hanna are on the scene too!!!!! Prism Browns and Blues create a lovely base. For all of you celebrating Independence Day, I wish you a safe and Happy Holiday!!!!! 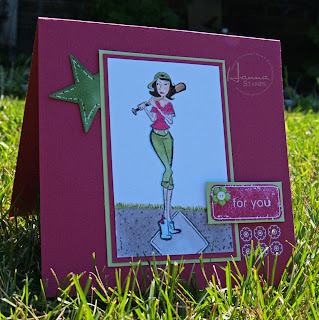 Another Sneak Peek of the new releases from Hanna Stamps. Don't forget to attend the Hanna Release Party on Thursday Night at 9 p.m. est. Have a great day , I'm late for work AGAIN!!!!! !